Jennifer died suddenly at the beginning of December. "Former Labour County Councillor for the Dyfan Ward in Barry, Jennifer Cole, will be greatly missed by her friends and family, for her warmth and wit as well as her loyalty and passion for human rights and social justice. One of the first women to play a leading role in the trade union movement in Wales, representing the Banking and Finance Union at UK level, she was also a leading member of the Wales Assembly of Women standing up for women's rights locally, nationally and internationally helping to influence the development of policy at the highest level". She spent Xmas 2011 with Alan and I in Chesterfield along with mutual friend Ann SEYFANG arriving a full day late and also several hours late on the rearranged date, having failed to get organised in time, not unusual. She also overshot the turn for the house, having to ring for directions. She arrived triumphantly bearing a huge ham, obtained from an up -market mail order company she often used. This was accompanying her on her Royal Progress in the north, had to be kept cool in the car overnight and was to be distributed as largesse for all friends to share at each 'pit' stop. Exercise was anathema to her until recently when health issues became more prominent. Her many health problems were viewed as inconveniences to be sorted as quickly as possible so that she could get on with important things. We had known each other for over 40 years, both being founder members of Lincoln Conservation Society. Thereafter we were in contact intermittently through visits or by phone. She was entertaining, warm, generous, talkative and opinionated. It was a joy and a privilege to have had her as a friend and I miss her chirpy, indefatigable, lively presence very much. 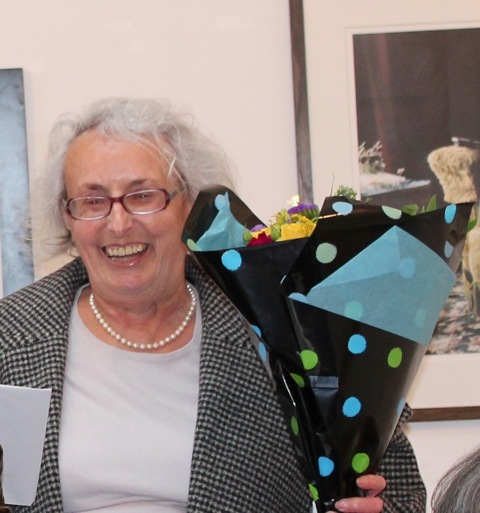 She was a very active socialist and feminist with strong Trade Union affiliations having spent much of her working life as a Trade Union Official and latterly in south Wales as a local councillor and chairperson of the Wales Assembly of Women.